hello! i'm yasimone, a writer, filmmaker, photographer, and artist! like my blog? enter your email address to follow me and receive notifications for new posts as soon as they're up! books, music, film, & beyond! Hi all! I hope you are having a great November! 🙂 I know I am, and I can’t believe that the month is already nearly over! Mockingjay Part II, the thrilling conclusion to Katniss Everdeen’s whirlwind revolution, has officially premiered today! I’m happy to say that I was able to attend an early double-feature showing of Mockingjay Part I—which came out last year—and II two days ago and follow Katniss in the last leg of her journey! 😀 It lasted about five hours, with an intermission break in between the two movies. Realizing the stakes are no longer just for survival, Katniss Everdeen (Jennifer Lawrence) teams up with her closest friends, including Peeta (Josh Hutcherson), Gale (Liam Hemsworth) and Finnick for the ultimate mission. Together, they leave District 13 to liberate the citizens of war-torn Panem and assassinate President Snow, who’s obsessed with destroying Katniss. What lies ahead are mortal traps, dangerous enemies and moral choices that will ultimately determine the future of millions. I will start off my review of Mockingjay Part II by saying that I was truly amazed by this film. It started exactly where Mockingjay Part I had left off the year before and did not disappoint in picking up action as quickly as possible. Of course, this star-studded cast that we’ve all come to love and support were simply great. The dialogue and interaction between characters is so natural and real. Jennifer Lawrence, as always, did wonderfully in her role as Katniss—especially in this thrilling conclusion to the Hunger Games series. She just brings a sort of emotional intensity that Katniss also shows in the trilogy, and I doubt that anyone would be able to do it as well. Another actor I would like to recognize is Donald Sutherland, who plays President Snow; I am always in awe at how he portrays this character with such ease and keeps him grounded and believable. The pin and lanyard I got at the double feature. Definitely not taking it off for the next week or so. The special effects were, as per the norm for The Hunger Games films, spectacular and very realistic. The war scenes are gritty and intense—and I think another thing that I loved particularly about Mockingjay Part II is that there is no straightforward “villain-hero” relationship in this installment. It is full-blown war, and in war, anything is possible. And now a little bit about my experience at the double feature showing itself: This is actually the first double feature I’ve ever attended, and I am super glad that I went. It was just such a great atmosphere and watching the two movies back to back was very enjoyable as well. Everyone who attended received a lanyard with a special pin and a holographic card that switches between two versions of the Mockingjay pin symbol. Another one of the highlights was when we had finished watching the first movie and during the intermission break, a mini-trivia game was held, and prizes were being given out to anyone who answered a question correctly! I actually ended up answering a question and winning a Blu-ray disc of Mockingjay Part I! It’s been three long weeks since you all heard a peep out of me, but I’ve been insanely busy lately; so much so that I haven’t been able to properly sit down at my laptop and type up anything. Sorry about that! 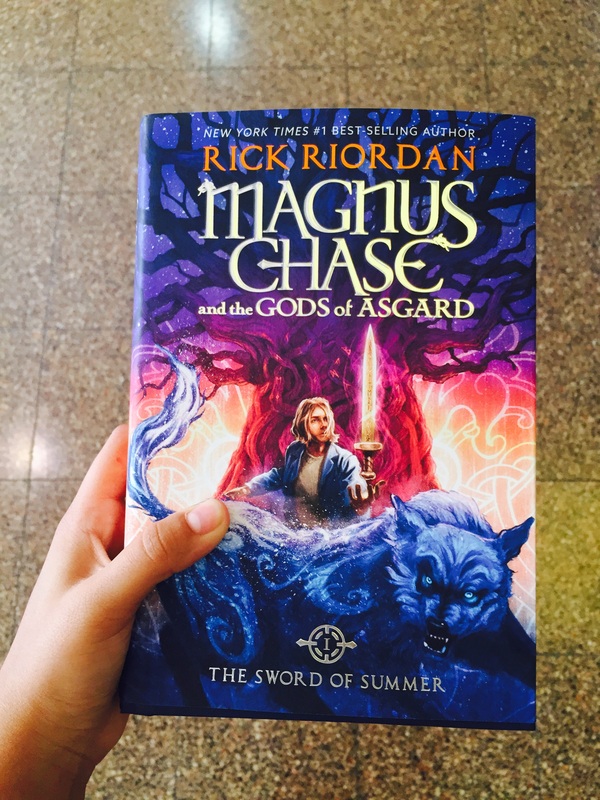 Here’s the long-awaited review of Magnus Chase and the Gods of Asgard: The Sword of Summer. I finished it a while ago but never found the time to review it—I hope you enjoy it! And yet, it’s the furthest thing possible from the end of his adventure. After landing in an afterlife for the brave who are being trained to fight in Ragnarok, the battle of the apocalypse, Magnus realizes that everything in his life has changed. Teaming up with a teenage warrior, a fashionable dwarf, and an elf who is learning magic, Magnus must find out his family history, what to do with the ancient Sword of Summer, and how to stop the Seven Worlds—especially Midgard, the human world—from being taken over by evil forces while trying to stay alive at the same time. Rick Riordan is back at it again! (By that I mean that he is writing books that cause me to go completely fangirl-crazy over and hand my money over to bookstores without a single coherent thought.) 🙂 In all seriousness, however, this book was so good! Ugh, where to begin…? Since I’m not sure how else to review this book without going on a long rant, I’ve organized everything into bullet points. + First of all: Norse mythology! It’s pretty new for me—I’m a nut for Greek, Roman, and Egyptian mythology but I’ve never really delved into the world of Odin, Thor, and the others. Can’t wait to learn more! + When I was first starting the book, I’ll admit that I was rather scared that Magnus Chase would be a clone of Percy Jackson, personality-wise. Luckily, he’s his own person—and that definitely pleases me. 🙂 However, it does seem that the two have the same snarky, witty sense of humour. While I did quite enjoy Magnus’s amusing observations of the situations he lands in and the people he meets, it was a bit too reminiscent of the Percy Jackson novels. + The cast of The Sword of Summer is very diverse, and I think that’s wonderful! 🙂 You’ve got Magnus, who happened to be homeless, Blitzen, an African-American dwarf, Hearthstone, a deaf elf, Samirah Al-Abbas, a Muslim teen girl who just happens to be a warrior for the Norse gods, and a ton of great characters. It makes me happy to see minorities represented in literature. + The plot was compelling and exciting for the most part. The ending dragged a bit and was rather predictable, to be honest, but overall, it was an action-packed and suspenseful novel. I still found myself liking Riordan’s previous books better, but I still really enjoyed The Sword of Summer, which was a relief.